The 6 Factors of Health & Wellness were developed by D.D. Palmer the founder of chiropractic. Each one of these factors are extremely important for your health and well-being. I highly recommend assessing where you may be out of balance in these 6 Factors of Health. Empowerment Education is the first factor of health. This is what you are doing now. Its important to consistently educate yourself about your health so you can continually move towards better health. Rest and Sleep is the second factor of health. You heal and restore when you sleep. Have you ever had 4 hours sleep? What did it feel like the next day? Did you know that your immune system is 50% weaker with 4 hours sleep vs. 8 hours. Did you know that 1 hour of sleep before midnight is twice as restorative as 1 hour sleep after midnight? You will feel more restored sleeping from 10pm-6am vs. 12am-8am. Mind Emotions and Spirituality is the third factor of health. Prayer, journaling and other methods of getting in touch with your emotions and spirituality vitally important. Exercise and Rehab is the fourth factor of health. Being active, does more than make our muscles stronger. Weight resistance strengthens our bones. Cardiovascular helps our heart and lungs as well as gets the lymph pumping. Exercise helps us feel younger, as long as you don’t over exercise…. Customized Clinical Nutrition is the fifth factor of health. Nutrition is about customizing a program to remove toxicities and feed deficiencies which will restore your vitality. Learn more under 7 Pillars of Health. 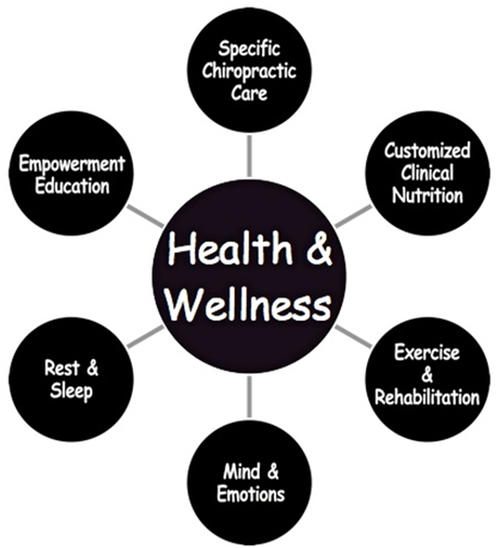 Specific Chiropractic Care is the sixth factor of health. Chiropractic is about restoring the life force between your brain and your body. When there is pressure on the nerves, you organs and muscles function will be affected. Chiropractic removes this interference and gives your body the chance to heal.